We recently had the chance to review a few Spicurean Spices from Mountain Rose Herbs. "At Mountain Rose Herbs, we are committed to providing exceptional quality culinary ingredients that even the most discerning epicurean will applaud. 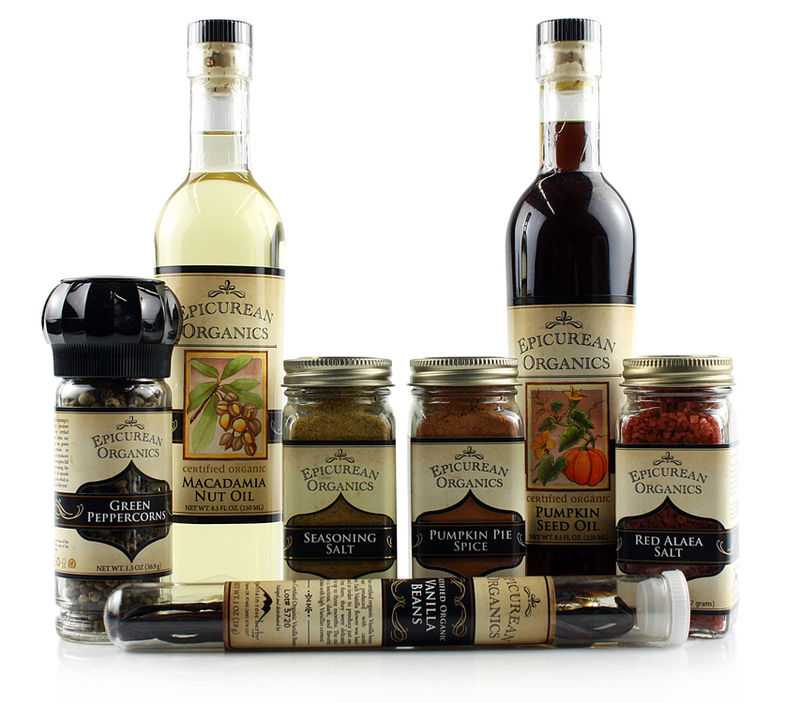 The bold flavors, rich colors, penetrating aromas, and nutrients found within whole organic botanicals inspired us to create the Epicurean Organics collection. Our gourmet seasoning blends, artisan salts, whole peppercorns, and fine culinary oils make the perfect choice for experienced chefs and kitchen enthusiasts alike. We use only the freshest, organically grown botanical ingredients to produce these outstanding culinary delights. From lavender accented Herbs de Provence to bold Hawaiian sea salts and pure emerald pumpkin seed oil, these exceptional ingredients are sure to enhance any delicious creation! The farmers who grow our herbs and spices are given full negotiation rights in determining the price of their harvests under our Good Trade Program. This far exceeds traditional fair trade standards - which is good for the growers and good for you! Mountain Rose Herbs also donates 2% of the proceeds from this line to the Organic Consumers Association in thanks for their important work. This helps support the organic movement with every meal you lovingly prepare. Beautifully packaged in recycled glass bottles with post-consumer waste paper labels and original botanical watercolors, the Epicurean Organics collection will bring elegant charm and exquisite flavors to your spice rack." "This blend packs a punch with its bold flavor and penetrating aroma which holds itself well against high heat and direct flame. Popularly used as an all purpose flavor enhancer for any item which you grill or barbeque where most seasoning will burn off or dissipate. Contains the following ingredients: Organic Garlic, organic Rosemary, organic Black Pepper, organic Thyme, and organic herbs." A blend of Black, White, Green, and Pink Peppercorns"
"Himalayan Pink Salt is one of the purest salts available for culinary, therapeutic and cosmetic uses. This delectable salt has beautifully formed crystals which range in color from off-white to a lustrous pink, which indicates a quantifiable amount of 84 trace elements & iron. The benefits are endless but Himalayan Pink Salt is primarily used for gourmet cooking and in bath preparations." What we thought: These Spices were fantastic! The Grilling Blend was excellent for, you guessed it, grilling! We grill at 2-3 times a week year round, so having an all-in-one grilling spice has been wonderful! It is the perfect blend of spices and has tasted wonderful on chicken, pork, beef and even shrimp! The Rainbow Peppercorn is a tasty blend of delicious peppers and super convenient to have in the spice cabinet. The Pink Himalayan Salt is fabulous. I love the coarse grain and the flavor isn't crazy salty, but perfect for jazzing up anything you would usually add salt to. We really enjoyed each of the spices from the Epicurean Organics line at Mountain Rose Herbs, but they have a much larger variety than just great organic spices. They have extensive collections of bulk organic herbs, spices and other ingredients, teas and tea supplies, aromatherapy and essential oils, bath and body care, natural health, home, garden and gifts and more! If you love trying out fantastic products, check them out! ABCD Diaries gives Mountain Rose Herbs an A+! Buy It: Find these fabulous spices and much, much more at Moutain Rose Herbs! Disclosure: ABCD Diaries was given a sampling of spices for review purposes only. We were in no other way compensated. The opinions expressed in this post are ours and ours alone. I also love Mountain Rose I find their blends to be spot on in flavor and aroma.